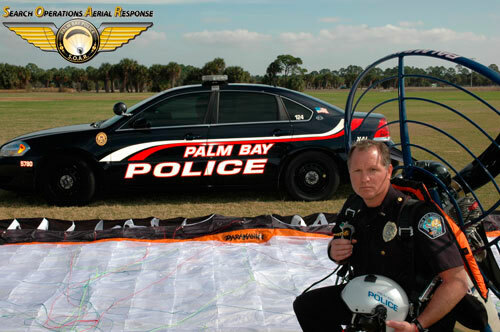 With the success Palm Bay Police have had with their recent relaunch of the SOAR projectand with new more suited equipment the Police department have been completing a multitude of missions without any problems at all. Lt. Joe Eakins and Mark Renkens have been testing different wings and paramotors through 2009 and 2010 and have found the Paramania Revo2 to best suit their needs for the tough conditions they have to face, weather it is taking off from wet due swept feilds on hot summer days without risk of delays or blown launches to flying at speed in strong conditions. The guys are overwhelmed by the overall usability compared to the equipment previousy used,allowing them to concentrate on the flying and mission at hand. With all the media coverage they have been getting in the US, other Police departments have also taken interest, and are seriously contemplating updating their search and rescue teams and police department with paramotoring equipment. Its only time before we see paramotoring become an acepted platform amongst national security and other human aids around the world. This entry was posted in AIR, Air Videos, Paramotor News and tagged paramoteur, paramotor, paramotor ppg news, ppg, video by Admin. Bookmark the permalink.